This year's been a busy one, particularly with all of the work that's gone into creating Pathfinder Playtest scenarios, reviewing feedback, discussing the Second Edition organized play program's structure, and conveying that in a bunch of really big blogs. While that's been really productive from a looking-to-the-future perspective, it's been less fulfilling in the present because we had fallen way behind in our Additional Resources and Campaign Clarifications process. Over the past 8 weeks, the developers have revisited how we approach these books, devised better ways to streamline the whole process, and pushed through numerous months' content. This year's been a busy one, particularly with all of the work that's gone into creating Pathfinder Playtest scenarios, reviewing feedback, discussing the Second Edition organized play program's structure, and conveying that in a bunch of really big blogs. While that's been really productive from a looking-to-the-future perspective, it's been less fulfilling in the present because we had fallen way behind in our Additional Resources and Campaign Clarifications process. Over the past 8 weeks, the developers have revisited how we approach these books, devised better ways to streamline the whole process, and pushed through numerous months' content. You may have seen the Additional Resources update two weeks ago, and we're pleased to have another release going up later today! With this, we've addressed every book published in 2018 except Pathfinder Player Companion: Martial Arts Handbook (it's coming in our next update). As the organized play campaigns are community-led programs, we appreciate having the input of our community's leaders in evaluating which content to include. This wouldn't have been possible without the ongoing efforts of our volunteer review teams, led by Venture-Captain Alexander Lenz. Helping him in this endeavor are James Anderson, Sasha Lindley Hall, Þórarinn Sigurðsson, and many more. These teams of venture-officers read through the Campaign Setting, Player Companion, and RPG hardcover books searching for any ambiguities and mechanics that could be disruptive in the organized play environment, flagging these for the developers to review. It helps us resolve so many more clarifications from the start and speeds up the process considerably, and we're very appreciative of their work helping keep these documents up to date. As we look ahead, we're already working on January's update (Pathfinder Player Companion: Wilderness Origins, Pathfinder Player Companion: Martial Arts Handbook, and Pathfinder Adventure Path #138: Rise of New Thassilon). Going forward, our goal is to update the Additional Resources and Campaign Clarifications documents either on the products' street dates or very shortly thereafter. But we're not just bringing you more player options; we're also sanctioning more playable content. In addition to Pathfinder Module: Seers of the Drowned City and Pathfinder Adventure Path: War for the Crown getting finished up soon (expect a blog next month), Thurston Hillman brings three new adventures into Starfinder Society to help elevate your PCs to new level heights—while also taking them to new, terrifying depths. We're also proud to announce the sanctioning of the Signal of Screams Adventure Path! While the third and final adventure of the series will release soon, we wanted to make sure that this adventure path got out as quickly as possible to our players. I suspect this adventure should see play from our most experienced Starfinders, as its higher-level range makes it a perfect opportunity to play through with some of your mid- to high-level characters. Unlike our other adventure paths, Signal of Screams does not include a repeatable first scenario; this is intentional, as the Adventure Path's serious horror themes make it less suitable for repeated play. Luckily, you can still use other replay methods (such as a being a member of a certain faction) if you really want to experience the "torment" over again. Just be careful—PCs going through the Signal of Screams Adventure Path are likely to come out… changed! Join us next week as we look back at a great year of organized play! The world of Verces is a tidally locked planet, one hemisphere always facing the sun as it makes its orbit. As such, half of the planet is baked by constant heat, while the other half is a frozen wasteland. However, a strip of habitable terrain circles the planet where the two sides meet, a temperate zone in a state of constant twilight. Most of Verces's sentient life evolved in this area, which eventually became known as the Ring of Nations, a unified coalition of countries. In Starfinder Adventure Path #11: The Penumbra Protocol, the heroes travel to Cuvacara, the capital of Vimal, one of the larger nations on Verces. Known as the "Dusk Jewel," Cuvacara is a bustling metropolis that is home to the Assembly of Nations, where the Ring of Nations' government council meets to make policies. Thousands of cybernetics and computer corporations own offices and factories in Cuvacara, and the heroes must investigate one of these companies to learn more about the creepy incidents that befell them on the asteroid resort New Elysium in the previous adventure. But, of course, not everything is what it seems to be, especially in a city like Cuvacara, where every shadowy alleyway has the potential to hide a deadly secret. 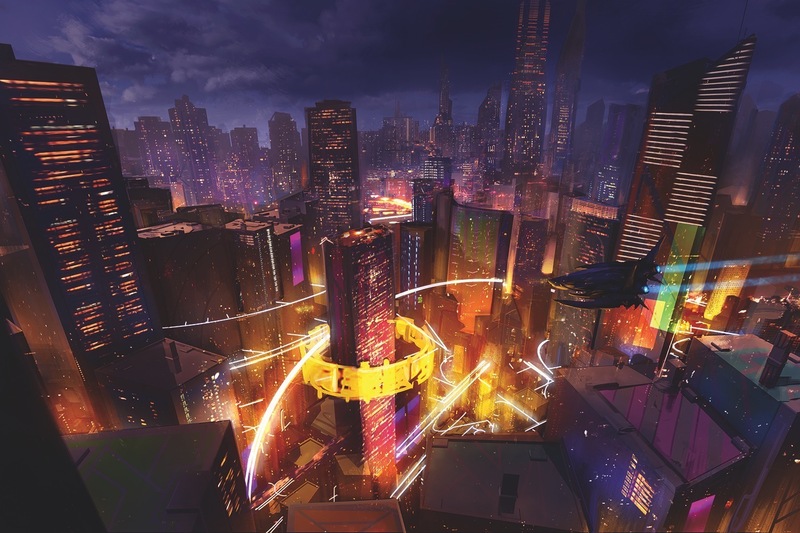 Both "The Penumbra Protocol" adventure and the accompanying Cuvacara gazetteer were written by Jenny Jarzabski, turning from the warm glow of the sun in the Starfinder Society scenario "The Solar Sortie" to these neon-drenched streets. 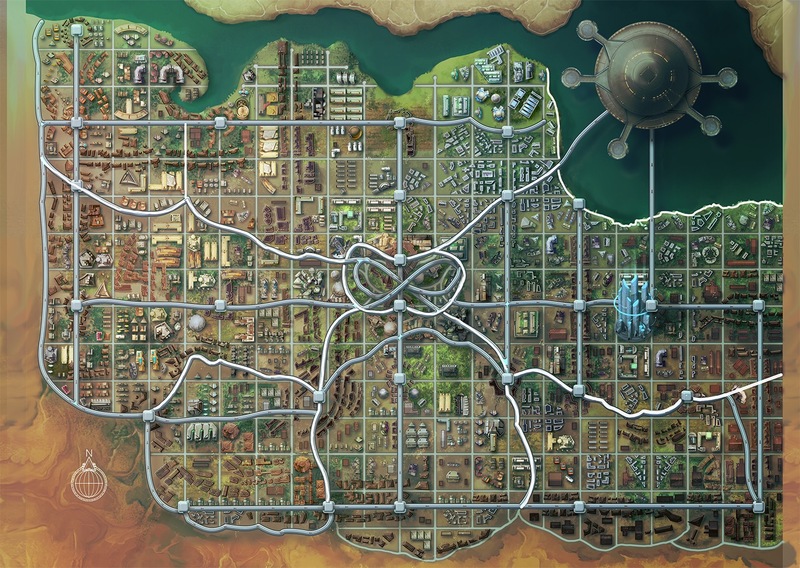 (Hmmm, I guess we like giving Jenny alliteratively titled adventures…) Jenny introduces us to a wide variety of Cuvacaran citizens, but rather than describe them and spoil all the surprises, I thought we would show off this incredible map of the Dusk Jewel. Those gray lines represent the city's mass transit system: elevated bullet trains that can transport passengers around Cuvacara in a matter of minutes. 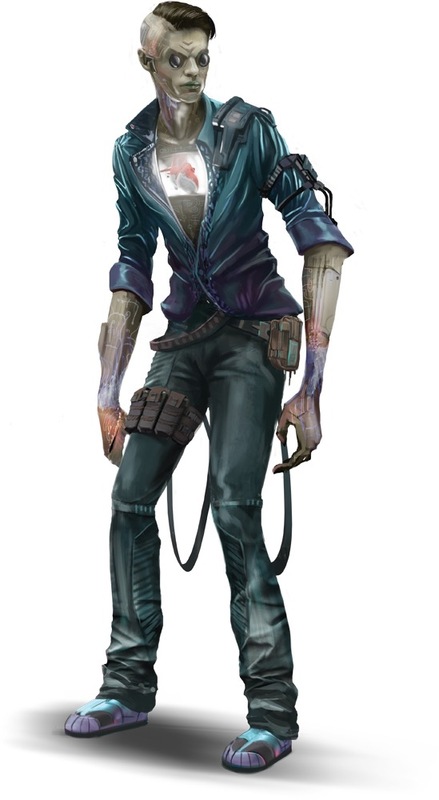 The citizens of Verces are known to embrace cybernetic augmentations and Cuvacara is no exception. In fact, the city is on the cutting edge of these enhancements and experimental cybernetics are often available in the Dusk Jewel before they hit the wider marketplaces. A handful of new Vercite augmentations are presented in this volume, including these bionic knees, which I would definitely purchase in real life as I get older. Complex actuators and servos are installed in your knees, giving you the power to make impressive leaps. You always count as having a running start when attempting Athletics checks to jump. In addition, you don't fall prone if you fail an Athletics check to jump by 5 or more. Finally, the damage you take from the first 10 feet of a fall is converted into nonlethal damage, even if you aren't falling onto a yielding surface. Finally, in addition to some creepy new monsters by Jenny Jarzabsi and James L. Sutter and a glimpse of planet ravaged by Hellfire by Owen K.C. Stephens, this volume presents a detailed look at the shadowy fiends known as velstracs by Isabelle Lee. 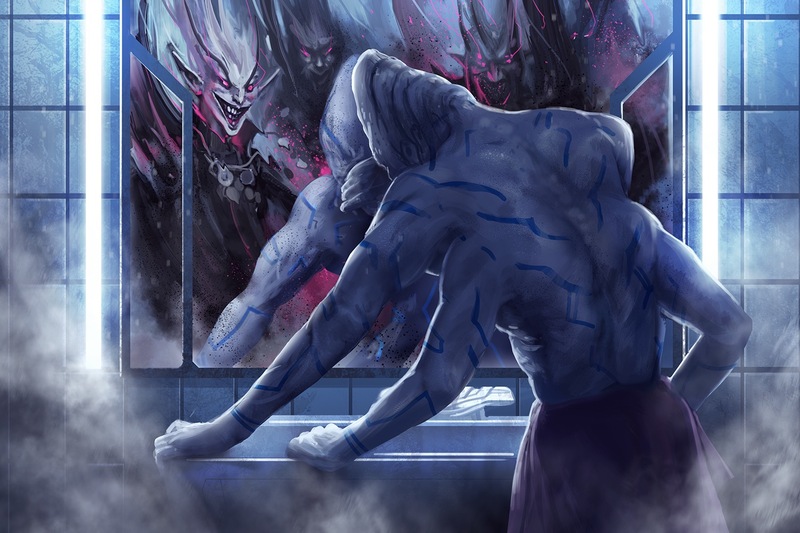 These twisted outsiders have unsurprisingly embraced the modern technology of the Material Plane, some of them integrating such equipment into their own forms as they seek an undefined perfection of body and mind. With some gruesome magitech augmentations and painful weapon fusions, this article certainly isn't for the faint of heart! That's all I can really reveal without spoiling too much about the Signal of Screams Adventure Path, but hopefully this tantalizing preview will get you exciting to enjoy the scares and thrills of The Penumbra Protocol! Do you want to hear a scary story? It all began on a cold, dreary winter's night. A thin mist covered the ground, and the streetlights did little to pierce the gloom. Most people were in their homes, huddling under blankets, sipping warm cocoa, and basking in the comforting glow of their television sets. Most sane people, that is. But one man shunned the comforts of the hearth to sit hunched over a laptop, typing furiously. The computer's sickly light emphasized his haggard appearance, making him look more like an animated corpse than a living person. He composed an unhinged manifesto of shadowy horrors, blood-curdling mutilations, and the seductive nature of evil. And when he was done, he slumped across the keyboard dead asleep, not caring about the nightmares that would most assuredly come. Do you want to hear a scary story? It all began on a cold, dreary winter's night. A thin mist covered the ground, and the streetlights did little to pierce the gloom. Most people were in their homes, huddling under blankets, sipping warm cocoa, and basking in the comforting glow of their television sets. Most sane people, that is. But one man shunned the comforts of the hearth to sit hunched over a laptop, typing furiously. The computer's sickly light emphasized his haggard appearance, making him look more like an animated corpse than a living person. He composed an unhinged manifesto of shadowy horrors, blood-curdling mutilations, and the seductive nature of evil. And when he was done, he slumped across the keyboard dead asleep, not caring about the nightmares that would most assuredly come. Seriously though, this three-part space horror Adventure Path is the first Starfinder product that I had the pleasure of concepting and developing from start to finish, and I couldn't be prouder or more excited to share it with you. While I didn't actually spend any late nights putting it all together, I couldn't have done it without the entire Starfinder team (who helped brainstorm the spookiest of ideas) and all the terrific authors that agreed to work on this project! And of course, I can't forget the artists who helped bring these chilling visions to life, as well as the art, editing, and other departments here at Paizo that make sure you get the best product possible! The first adventure, The Diaspora Strain, comes out very soon and sees a group of 7th-level characters get invited to the grand re-opening of a luxury resort asteroid in the Diaspora called New Elysium. The facility has been newly automated with a virtual intelligence program and the PCs, along with a handful of celebrities, will be the first guests to put the system to the test. I don't want to spoil any surprises, but of course, things don't go quite as planned. Author (and fellow Adventure Path developer) Chris Sims has put together a spooky adventure that will have player characters question their sanity. 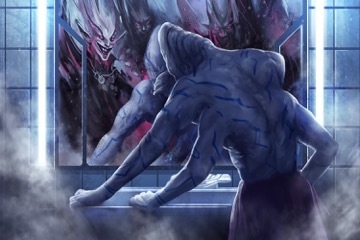 In addition to some creepy new monsters and details on a lonely world accessible only through the Drift, this first volume features an article about a corruption system new to Starfinder that will get used throughout the campaign (by me) and advice on to run and play in Starfinder horror adventures by Epidiah Ravachol, author of the very popular indie horror RPG Dread! What is the mysterious Signal of Screams? Find out this winter, if you dare! Signal of Screams Adventure Path Announced! 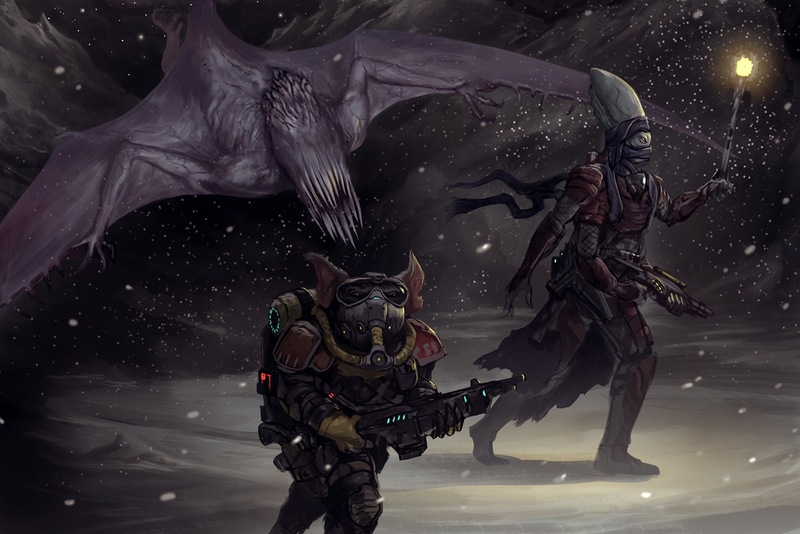 Early this year, we let you know that the Starfinder Adventure Path is going monthly starting in August, starting with the 3-volume campaign Against the Aeon Throne. While that Adventure Path is perfect for heroes who want to strike a solid blow against the sinister Azlanti Star Empire when they unlawfully annex a Pact Worlds colony, it will be over by November! We mentioned that we will be returning to the 6-volume Adventure Path format in February of 2019, but we have yet to say what's going on in between. Well, witness as the shadows part to reveal terrible, twisted forms and soft clink of chains. I am so excited—rapturously so—to preach unto to you of the beautiful pain to be found within the Signal of Screams Adventure Path. It all begins when the heroes are treated to an all-expenses-paid vacation to New Elysium, a posh resort on a remote asteroid in the Diaspora. Things slowly begin to go awry, as all good things eventually do, and they will have to protect themselves and some of the other guests from a creeping madness infecting both the staff and the facility. Eventually, their adventures will take them to the Darkside of Verces and beyond as they struggle to overcome the architects of this affliction before it spreads to the rest of the Pact Worlds... and possibly into their souls! Paizo's very own Chris Sims is writing the first adventure, "The Diaspora Strain," which is for 7th-level characters. That's right, your heroes can go straight from Against the Aeon Throne to Signal of Screams once they return to the Pact Worlds. After all, they deserve a bit of R&R after escaping from Azlanti space with their lives! This volume also includes a new system of corruption that will plague your heroes throughout the campaign written by yours truly, as well as advice for running horror campaigns in the Starfinder RPG written by Epidiah Ravachol, author of the incredibly popular indie RPG Dread. It's going to be such a scream! From your players, of course.